In 2012, Iran's exports of crude oil and lease condensate dropped to their lowest level since 1986 (see chart above) as the United States and the European Union (EU) tightened sanctions targeting Iran's oil sector. Iran's 2012 net estimated oil export revenue, at $69 billion, was significantly lower than the $95 billion total generated in 2011. Oil exports make up 80% of Iran's total export earnings and 50% to 60% of its government revenue, according to the Economist Intelligence Unit. Sanctions affecting investment in Iran's oil sector have also been tightened, resulting in cancellation of new projects by several foreign companies; they also negatively affected existing projects. Following the implementation of sanctions in late-2011 and mid-2012, Iranian oil production dropped dramatically. Although Iran had been subject to four earlier rounds of United Nations sanctions, these much-tougher measures passed by the United States and the European Union have severely hampered Iran's ability to export its oil, which directly affected its production of petroleum and petroleum products. The U.S. and EU measures prohibited large-scale investment in the country's oil and gas sector, and cut off its access to European and U.S. sources of financial transactions. Further sanctions were implemented against the Central Bank of Iran, while the EU imposed an embargo on Iranian oil and banned European protection and indemnity clubs (P&I Clubs) from providing Iranian oil carriers with insurance and reinsurance. The implementation of insurance-related sanctions was particularly effective in stemming Iranian exports, which affected not only European importers but also Iran's Asian customers who were forced to temporarily halt imports. Iran's exports of crude oil and lease condensate declined to approximately 1.5 million barrels per day (bbl/d) in 2012, compared to 2.5 million bbl/d in 2011. This 39% decline in exports was coupled with a 17% drop in crude oil and condensate production and a 1% decline (see chart below) in liquid fuels consumption including gasoline, diesel, jet fuel, and other products. 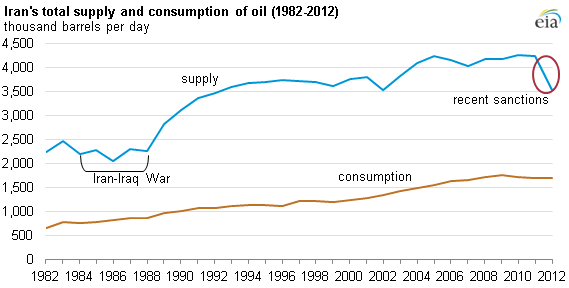 Source: U.S. Energy Information Administration, International Energy Statistics Database and Short-Term Energy Outlook. Note: Supply includes crude oil and lease condensate, natural gas plant liquids, and other liquids. While the world's supply of oil increased by about 2%, or 1.8 million bbl/d in 2012, oil production in Iran declined by nearly 700,000 bbl/d from the 2011 level. Most of the 2012 drop in production is attributable to tightened sanctions. A smaller decline in 2011 resulted mainly from declining production in aging fields. Iran remained the second-largest OPEC crude oil producer on average during 2012, but it exceeded Iraq's production only narrowly. In August 2012, Iran's monthly crude oil production fell below Iraq's for the first time since 1989. The EU reinsurance ban from 2012 began to affect refiners in April of this year when insurance contracts for refineries came up for renewal. The EU ban created uncertainty for refiners as to whether they would be able to obtain insurance. These sanctions have been interpreted by EU insurance companies to mean that they are barred from providing coverage to any refiner and refinery operators that process crude oil of Iranian origin. This provision will mostly affect refiners in South Korea and India, which rely heavily on European insurance providers. The sanctions may further affect Iran's exports and production over the next few months as refiners try to find alternative suppliers of insurance. For more information about Iran's energy sector, see EIA's Iran Analysis Brief.